It’s not a command, just a title of the post. 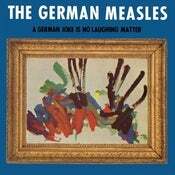 Here is a link to listen* to the new The German Measles album, A German Joke Is No Laughing Matter (what’s your rupture). Think Tyvek, lo-fi garage pop. The German Measles will be opening for Slumberland recording artist CRYSTAL STILTS at Dada on April 30th. On Sale now. *-must be logged into soundcloud to listen. This entry was posted on April 11, 2011 at 9:13 pm, filed under News.